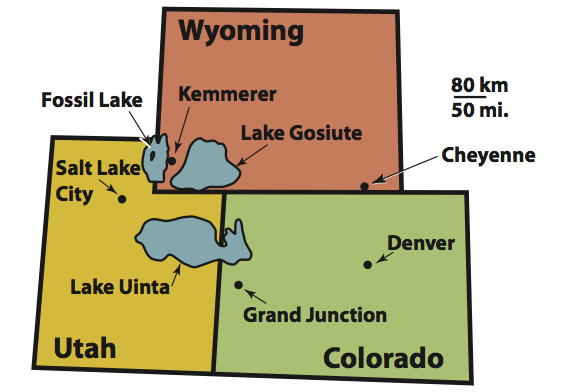 Fifty million years ago, three large lakes covered Wyoming, Colorado, and Utah. The smallest, now called “Fossil Lake”, was 50 miles long and 20 miles wide at its maximum. Unlike modern Wyoming, the climate was subtropical with verdant forests of palms, figs and cypress. Willows, beeches, oaks, maples and ferns grew on the lower slopes of mountains that rose near the water. The warm lake waters supported 25 kinds of fish and stingrays, insects, crocodiles, snakes and turtles, bats, birds, the first primates and dog-sized horses and rhinos. When the animals died, many settled to the bottom of the lake. Over time, a constant rain of calcium carbonate, which precipitated out of the water, dropped to the bottom of the lake and covered the organism in layer after layer of fine grains. Without air, the organic layers could not rot. The mud thickened and pushed down on the organic material with increasing pressure. The temperature of the organic material also increased as other processes in the Earth produced heat. Mud sediment was buried by more sediment. Sediment changed to rock as temperature, pressure, and anaerobic bacteria—microorganisms that can live without oxygen—increased. 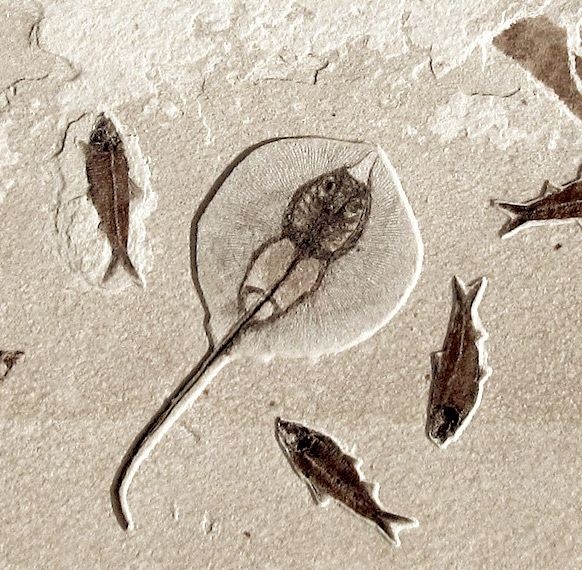 Although the lake once covered 1,000 square miles, the richest fossil beds only cover about 15 square miles. 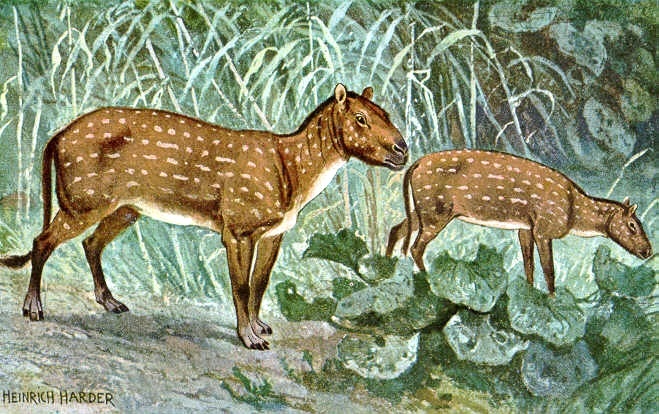 More rich fossil beds may be buried, but that is all that are exposed on the surface today. The great 19th-century paleontologist Edward Drinker Cope was one of the first to excavate at Fossil Buttes. He worked there in the 1870s. Today, Visitors from around the world come to both enjoy and dig in the remains of Fossil Lake. Each year, scientists, movie stars, athletes, and families join the staff at our quarry and unearth ancient treasures from 50 million years ago. This is one of the few locations in the world where visitors are allowed to keep the fossils they find and add them to their collections. For more information on digging with us visit www.fishdig.com or www.FossilShack.com.